Across America lives have been improved by Australian inventions—the cervical cancer vaccine, the bionic eye, gum that repairs tooth decay. What’s next? Some 30 million Americans use contact lenses. Today they can wear a single pair for up to 30 consecutive days and nights, safely and comfortably thanks to the work of CIBA Vision and CSIRO, Australia’s national science agency. Contact lenses were once rigid and had to be taken out every night. In 1991, a team of researchers from CSIRO, the University of New South Wales, and the Vision Cooperative Research Centre joined forces with CIBA Vision in the US, and Novartis in Switzerland, to create a better contact lens. Natural phenols, such as those found in chocolate, and minerals such as iron are being used to develop fast, economical drug-delivery capsules. 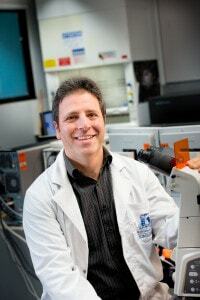 Frank Caruso and his team at The University of Melbourne are making nano-sized capsules that will encase vaccines and protect them from being broken down when entering the body. They believe that this delivery system will be biologically friendly and overcome a major challenge for medical materials: their compatibility with living systems. One of the challenges of treating diseases such as cancer and HIV is delivering treatment with minimal damage to healthy areas.